I had read about Krua Apsorn on CNNGO and as it was nearby we decided to check it our for dinner. Krua Apsorn is one of a number of popular restaurants on Thanon Dinsor which is about a 20 minute walk from our hotel on Phra Artit. There are a few other places on Thanon Dinsor recommended by the CNNGO article, you can read about them here. Like a lot of places in Bangkok there is both indoor and outdoor seating options. We had had our fill of Bangkok traffic fumes for the day thanks to Charlie's obsession with riding in tuk tuk so we opted for air conditioning. Krua Apsorn is an all round Thai restaurant which surprisingly aren't that common in Bangkok as most places seem to specialise in one or two dishes. In saying that Krua Apsorn is most famous for its seafood offerings so that's what we ordered. First up was the prawns in a sweet chill sauce, I'm not sure if the prawns here are different but they certainly don't look the same as what we get back home. They seem to have a larger head section, part of which is left on when they are served. In cutting these off to try the tail a kind of yellow creamy roe like substance oozed out so I decided to just eat the tail sections. This roe is probably considered a delicacy but it wasn't for me. The prawns were great and as usual the sauce was fantastic, beautifully sweet with a touch of chilli. 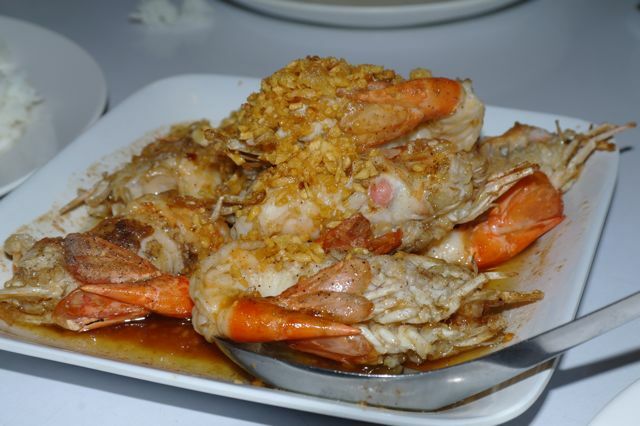 The other dish we ordered is pretty much Krua Apsorn's signature dish, stir fried crab meat in yellow chilli sauce. I just love the way crab is served over here, there's no mucking around trying to remove tiny mouthfuls of flesh out from the shell, all the hard work is done for you. This dish was incredibly spicy thanks to the slices of orange chilli. At first I didn't recognise these as chillies and was constantly cooling the fire in my mouth with glasses of iced fanta until Tina pointed them out to me. I think I thought they were carrot! 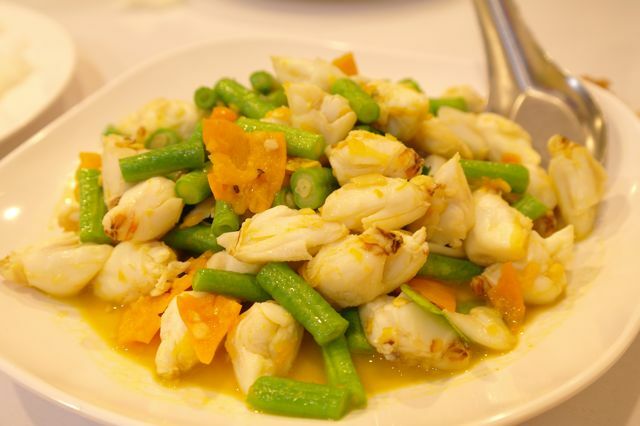 The crab meat was beautiful and the snake beans lovely and crunchy, a great combination. Neither dish was cheap by Bangkok standards at 300 baht each (approx $10). After dinner we crossed the road to Mont Nom Sod. We had spotted this place a few nights ago and I remembered it from one of my food books. 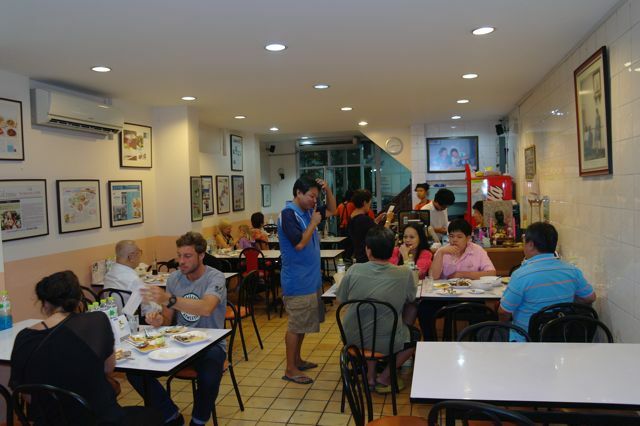 It has quite a history and was one of the only places you used to be able to by milk in Bangkok, milk is still considered a delicacy as are most dairy products. 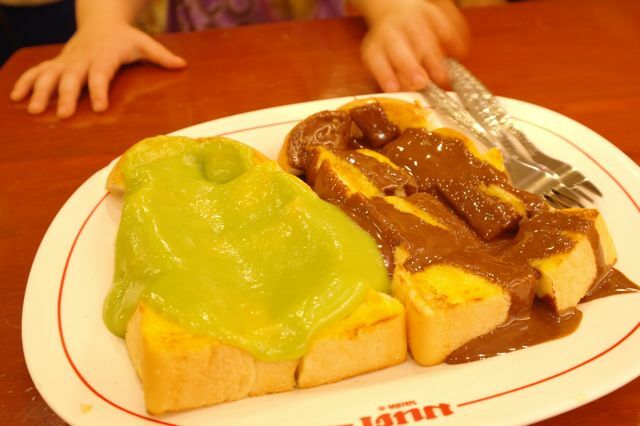 Nowadays Mont Nom Sod is famous for serving toast with sweet toppings. These are very popular with the young Thai in particular and the place was packed with kids in school uniforms at 8pm. Also testament to its coolness is the wall of photos of young Thai celebrities who have visited the shop. We chose the chocolate topping and a coconut custard that I think was coloured with pandan. They do something different to their bread over here as it is much sweeter and when combined with the custard toppings makes for a delicious dessert. Lots of different flavours are available with some special toppings only available on certain days. Charlie loved the chocolate topping the best, you can just see her little grabby hands about to sneak a piece in the photo above.